An in-house experiment to turn a last generation coin only vending machine into a cashless one. At LoyLap, we envisage a world where every inanimate object can be made to come alive and talk to our API’s. With IoT at the core, our engineering has always matched our Business philosophy of customizing the way our customers can accept payments. These are best showcased in our projects with the Central Bank of Ireland, where we converted existing employee cards as a tokenized cashless payments card (link to case) and Bannatyne Fitness Clubs, where we engineered wristbands that can be used to make purchases within the clubs premises (link video). Our engineering team set out to sharpen their IoT skills. Using nothing but a Raspberry Pi ecosystem, the challenge was to accept cashless payments on our office’s vending machine. 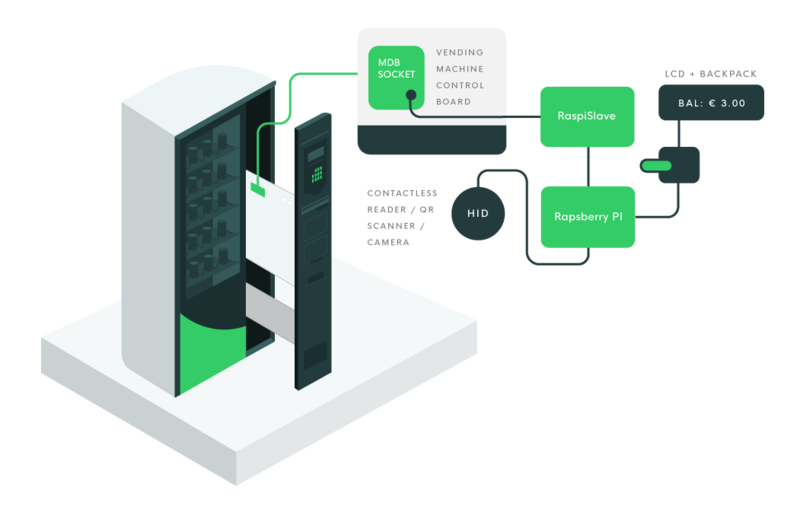 The idea behind this project was to ascertain the difficulty of making last generation vending systems accept cashless payments using simple and cost-effective means. A big thank you to our friends at BDS Vending, who provided us with a Necta Rondo vending machine to conduct our research work. Our engineering team worked with the following tools: Raspberry Pi, RaspiSlave, LCD USB Backpack, LCD Screen (16x2 or 20x4), Serial cable, MDB cable, Necta Rondó Vending Machine. We set up a Business in our test environment to simulate a live trial and had the Raspberry Pi connect to our cashless API’s. Next, we stocked the vending machine and trialed the machine for 1 week and noted some interesting results. Being part of the admin team, it was easy for us to tally sales and inventory due to the system feeding into our analytics portal. And with cashless, our team spent very little time in counting and holding coins or cash since majority of the employees chose cashless transactions over cash. Now when we translate these results for Businesses that use vending machines as an alternative source of revenue, we appreciate some of the benefits businesses can experience. The experiment was a simple exercise using Raspberry Pi for our internal vending machine. Businesses can avail of our vending integration where we use enterprise grade hardware to fully integrate with your vending machine. Our suite of cashless software is perfect for Business of every type, whether you are a Stadium, Restaurant, Fitness Club, Cafeteria.